You may have noticed the #metoo hashtag doing the rounds on social media in the last 24 hours. The campaign has arisen in light of the recent Harvey Weinstein accusations to demonstrate the scale and extent of sexual abuse and harassment that women face. To those people participating in this campaign: you have my respect. I believe you. However, it’s important to note that you are not required to disclose painful information about your life, least of all on social media. The extent of Harvey Weinstein’s abuse is staggering and many survivors of violence are struggling to contend with the daily onslaught of disclosures and incessant coverage of this. While those survivors deserve to be believed, respected and supported, it’s important to note that bearing witness to this rolling 24/7 coverage can be traumatic for many who may have experienced similar abusive behaviour. Reminder: you do not need to participate in this campaign to show your solidarity. You do not and should not have to recount or disclose your own experience(s) if this has negative implications for you. You are not being a bad ally or a bad feminist if you choose not to join in. Survivors of violence should not have to suffer further in order to get men to listen to them. While most perpetrators of violence are cis men, it’s also important to note that it’s not exclusively cis women who are the victims of their violence. Men and, in particular, trans women and, more specifically, trans women of colour, are also targets. Be kind to yourself. Take a social media or news break, if you need to. Talk to friends. Seek specialist and professional support if you need it. Undertake the self-care you need in order to stay well. Do what feels right for you. 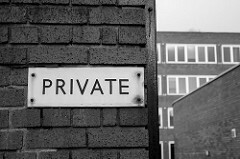 The image at the top of the page is a close-up black and white shot of a sign reading ‘private’. The sign is attached to a brick wall and appears to be in a residential area; you can see buildings in the background. Picture by Jeremy Segrott and shared under a Creative Commons licence. Joanna, you have written an important article, which I hope is read widely. Yes, the campaign to highlight abuse is significant and for those who feel reasonably comfortable disclosing their experiences, it may be very therapeutic. However, over many, many years, the scale of abuse towards vulnerable people has been colossal and it may not be helpful for all of them, to step forward at this time. There may be other ways that such individuals can register their support, for the issue, without disclosing their abuse in the media. Their own safety has priority.